In basic physiologic terms, the placenta is a site of exchange between the maternal and fetal bloodstreams. Nutrients and oxygen are extracted from the maternal circulation, and metabolic byproducts, hormones, and many other molecules are passed into the maternal circulation from the placenta. The placenta transfers many molecules into the fetoplacental pool proportionate to their concentrations in the maternal circulation. The three major modifiers of placental transfer function are maternal blood flow, fetoplacental blood flow, and placental trophoblast membrane permeability. By extension, factors that can limit fetal oxygenation, nutrition, and metabolism are (1) altered maternal perfusion, (2) altered fetoplacental perfusion, (3) reduced placental permeability, and (4) increased placental metabolic needs. Battaglia and Meschia describe the factors determining net fetal nutrient transfer: “… properties of the placenta, such as maternal and fetal blood flows, the pattern of placental perfusion, the surface, thickness and physicochemical properties of the placental membrane, the metabolic activity of the placenta, the various mechanisms of transfer which are available (e.g., diffusion, carrier mediated transfer, active transfer), and regional differences in placental histology and function” (our italics).1 High uterine blood flow, uniform fetal perfusion of the placenta, production of a fetal hemoglobin with greater oxygen affinity than maternal hemoglobin, high fetal cardiac activity, and increased fetal tissue perfusion are the main means by which optimal fetal oxygenation is assured. Normal placental growth and development will maximize placental efficiency while controlling its growth and metabolic needs. Fig. 1. A. Artery away from the implantation site with myxoid vascular change, 14 weeks’ gestation (hematoxylin-eosin, ×40). B. Normally adapted maternal spiral artery, early second trimester. The trophoblast’s intense vasotropism serves the purpose of establishing, from the earliest days of gestation, a maternal circulation providing the conceptus with nutrients. This circulation may be a sluggish capillary-derived blood pool. The circulation evolves, with spiral arterial remodeling, into a high-volume (capacitance), low-resistance circuit. The repeated failure to identify intervillous circulation both on direct visualization of the intervillous space and using perfused hysterectomy specimens before the 10th to12th week of pregnancy,14, 15 combined with documentation of a low-oxygen environment within the celomic cavity,16 make a standard arterial circulation improbable during embryogenesis. In this schema, too early initiation of maternal arterial perfusion of the intervillous space may damage the conceptus (via oxidative stress)17 and cause early pregnancy loss.18 Others have suggested that fixation artifact and intervillous flow rates (below the current limits of Doppler resolution) may explain most of the flow observations,19 but the evidence for the early embryo’s vulnerability to oxidative injury is also compelling.17 Early pregnancy intervillous flow is not likely a brisk arterial one, and is likely part of a highly unusual period of intensive cellular proliferation and differentiation despite comparative hypoxia. Fig. 2. Base of the placenta, showing a large maternal vessel entering the intervillous space (hematoxylin-eosin, ×4). The uterine arterial vasculature is comparatively and transiently denervated by pregnancy.28, 29 Because the placenta and umbilical cord are not innervated,30 perfusion within the uteroplacental and fetoplacental circulations must depend on anatomic and/or humoral mediators. There is decreased trophoblastic invasion of decidua at the placental margins compared to the center, with less extensive uteroplacental vascular conversion.31 Thus the placental margins are less well perfused, less functional zones that contribute little to placental exchange functions. Routine sampling of placental margins is of limited value. Villous morphologic changes in pregnancy are paralleled by placental functional maturation (Fig. 3A). The “primary villi” are columns of cytotrophoblast that extend from the cytotrophoblastic shell. The intervillous space at this age is essentially labyrinthine. Mesodermal invasion into (or in situ differentiation within) primary villi leads to “secondary villi.” The appearance of blood vessels transforms these into “tertiary villi.”40 The mature villous functional unit is a barrel, with the staves formed by the large fetal stem vessels, and the villous tree arborizing toward the center where the most recently formed villi are found.40 The fetal–neonatal postmaturity syndrome is considered to indicate insufficiency of the aging placenta,41 but some placental growth continues until late in gestation.42 If a placenta older than 42 weeks shows healthy terminal villi, and indication of active villous growth, a cause for fetal/neonatal compromise other than “placental insufficiency” may be sought. Fig. 3. A. The large villi of the early first trimester have a continuous (black arrow) two-cell layer of epithelium (outer syncytiotrophoblast, inner cytotrophoblast) with loose stroma and sparse, centrally located vessels containing exclusively nucleated erythrocytes (open arrow ) (hematoxylin-eosin, ×10). B. 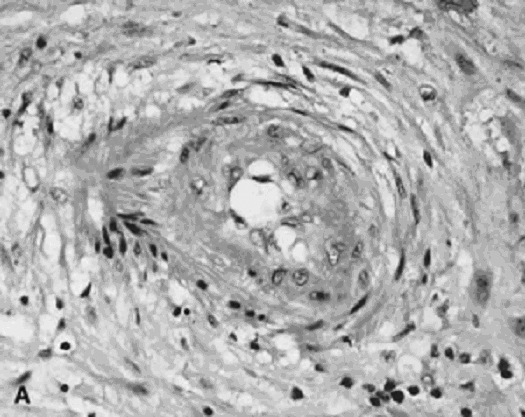 The small terminal villi of a term placenta (hematoxylin-eosin, ×10). 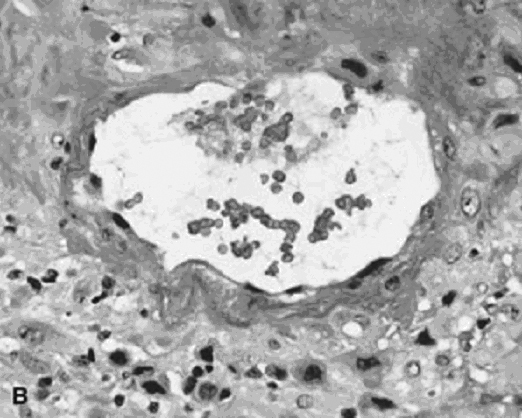 C. Vasculosyncytial membrane (arrows) is the hallmark of a term villus, near fusion of the trophoblast basement membrane with the fetal capillary endothelium, with adjacent normal syncytial knots (hematoxylin-eosin, ×40). The beating embryonic heart begins to pump nucleated erythrocytes from the yolk sac throughout the villus circulation by the end of the fifth week of gestation. 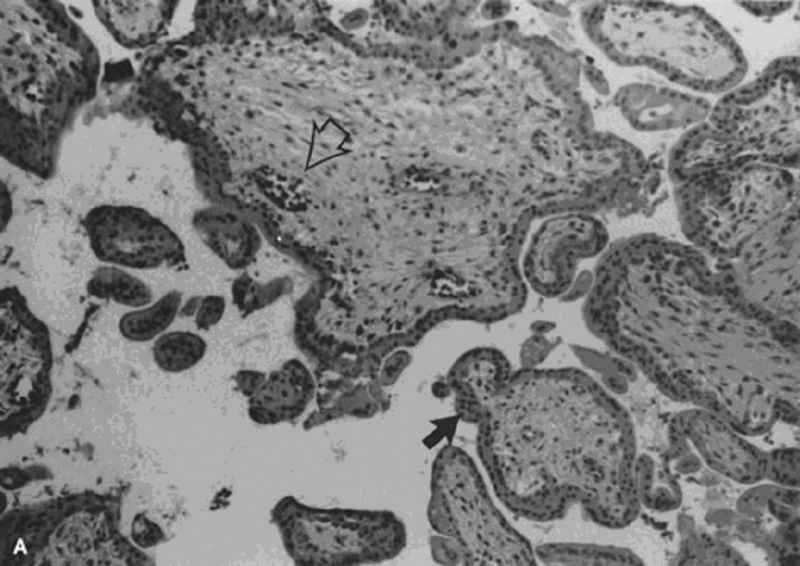 The proportion of nucleated and anucleate erythrocytes in the fetoplacental circulation is tightly correlated with crown–rump length.43 Villous macrophages (Hofbauer cells) are numerous throughout gestation (40% of stromal cells),44 although at term they may be less conspicuous. Villi arborize by mesenchymal invasion of syncytial sprouts.45 Sprouts can be deported into the maternal circulation, where they may influence maternal tolerance of the conceptus. Villi originally develop over the entire sphere of the conceptus, but atrophy over the extraplacental membranes by the end of the first trimester. Villous atrophy and tissue death related to this normal part of placental development may be difficult to distinguish from pathologic villous necrosis (e.g., infarcts). Remnants of ghost villi can be seen on the free membranes (chorion laeve) even at term. The chorion frondosum develops into the placental disc. Aberrant persistence of proliferating villi distant from the main placenta disk form “accessory” or succenturiate lobes. The delivered placenta is “deflated” compared to its state in utero, a consideration for anyone attempting ultrasound or anatomic correlations.26, 46 The average diameter of the delivered placenta at term has been reported as 18.5 cm (range 10.5–24.5 cm), with a mean thickness of 2.3 cm (range 1.1–4.1 cm).46 The same source described the early growth of the placenta as primarily an increase in diameter of the chorionic disc, while in the later stages of gestation, placental weight increased primarily due to an increase in placental thickness.46 They likewise reported the mean diameters of the placenta at the third to sixth months as 5.8 cm, 8.2 cm, 10.8 cm, and 13.0 cm, respectively. The number of major villous trunks remains constant;45 therefore, placental growth requires that each major trunk (established in the early months of gestation) must arborize or otherwise develop proportional to the increase in placental weight from early gestation to delivery. Schneider has recently reviewed the ultrasound data regarding placental volume in the midtrimester.47 The mean weekly increase in placental volume between 16 and 24 weeks was 31 ± 8 cm3; further, placental volume in the second trimester was closely correlated with infant birthweight, suggesting that midtrimester placental well-being is an important determiner of late fetal growth. In vivo studies in humans have identified a decrease in the volume of umbilical venous flow in the third trimester.52 Therefore, despite the remodeling of the placenta for increased functional capacity, there is a real potential for decreased fetal supply during the last trimester. At term the weight-specific placental oxygen consumption is almost five times as high as that of the fetus.53 Shortly before birth, the fetus also begins to prepare for extrauterine life by switching synthesis from hemoglobin F (HbF) to hemoglobin A (HbA). Although HbF has a higher oxygen affinity than HbA, which confers an “advantage” to the fetus favoring fetal oxygen extraction from maternal intervillous blood, late in pregnancy this advantage is reduced. These features combine to create a physiologic basis for “placental insufficiency” late in pregnancy and post term as fetal and placental growth, fetal and placental metabolic needs, and the maturational changes in Hb combine potentially at the upper limits of uterine supply. All placentas should be handled according to standard biohazard precautions. Gross examination can be performed on fresh specimens, or after 1–2 days of fixation in formalin. Prolonged refrigeration (5–7 days) does not affect histology. We prefer gross examination of fresh placentas, and select tissue samples that are subsequently fixed in formalin overnight before trimming or processing. Placentas from stillborn fetuses should not be fixed in formalin on receipt because placental fibroblasts may be needed for cytogenetic or other metabolic analyses. Microbial cultures should be performed in the labor and delivery suite, and not hours after birth in the pathology laboratory. Placentas must be weighed and measured. Different approaches to placental weighing (removing cord, removing extraplacental membranes, draining maternal intervillous blood) may be taken, but one method must be used consistently, and documented in the pathology report. The cord length and diameter are recorded. The fetal–placental weight ratio increases throughout gestation, and abnormally high or low ratios are likely indicators of fetoplacental pathology (see Table 1). A sample gross dictation form and suggested criteria for selection of placentas for pathologic examination are presented in Tables 2 and 3. Received fresh/fixed/not specifically labeled placenta is a _g placenta with a _g attached membranes and umbilical cord. The placenta is fragmented/round/oval/bilobate/accessory lobes and measures _cm × _cm × _cm in thickness. Membranes are complete/incomplete and site of rupture is indeterminate/at the placental margin/less than 10 cm/greater than 10 cm, from the nearest placental margin. Membranes are translucent/thickened/shiny/granular/green/yellow/foul smelling, with squamous metaplasia/amnion nodosum/hemorrhage. Marginal decidual necrosis is unremarkable/prominent/excessive. Intramembranous blood vessels are absent /present /intact ruptured and traverse unsupported for _ cm in the membranes. Membranes are inserted marginally/circummarginate/circumvallate over _% of the placental circumference. Maximal extent of placenta extrachorales is _cm. The umbilical cord has central/eccentric/markedly eccentric/marginal /velamentous insertion, _cm from the nearest placental margin and measures _cm in length and _cm in diameter at the fetal end and _cm in diameter at the placental end. The cord has true knot /hematoma/stricture /torsion/thrombosis not associated with hemostat marks, located_. The cut surface of the cord shows _ vessels with normal/edematous/decreased Wharton's jelly and no/venous/arterial thrombi. The chorionic plate vessels are tortuous/ectatic/thrombosed/calcified and subchorionic fibrin deposition is normal/increased/decreased, with the largest plaque measuring _cm × _cm × _cm in thickness. There is/is not grossly obvious missing placental tissue. There is fibrinoid deposition decidual/necrosis/calcification/blood clot covering approximately _ % of the maternal surface. The cut surface is pale/congested/firm/gritty/edematous and shows fibrinoid/infarction/thrombi occupying approximately % of the substance. The standard placental sections are submitted. Additional sections of grossly identified abnormalities are submitted as follows. Table 3. Which placentas should be examined by a pathologist? The placental parenchyma is grossly examined by slicing the maternal surface perpendicular to the chorionic plate at approximately 1-cm intervals, leaving the chorionic plate intact. Each surface of each slice is examined for obvious lesions (e.g., infarct, intervillous thrombi) or subtle lesions, such as increased villous granularity (e.g., villous swelling or chronic villitis). Villous tissue should be uniform in color; dark or pale areas may mark microscopic pathology. One cassette containing one section from the fetal end of the umbilical cord (the end closest to the baby), 2.5 cm from the insertion (to ensure accurate vessel count) and avoiding areas with evidence of cord clamping, and one strip of extraplacental membranes taken from the rim of the site of rupture (if identifiable). One cassette containing chorionic plate from an area with minimal subchorionic fibrin, and containing chorionic vessels. Three cassettes based on the basal plate. Examination of the uteroplacental vascular segments delivered with the placenta can be readily achieved, especially in the fixed placenta, in which they can often be seen as small irregularities or an S-shape on the maternal surface. Several thin slices of the basal plate may be placed in one cassette, and will generally yield at least one uteroplacental vessel for examination. These cassettes also provide chorionic villi from the central areas of the villous parenchyma, representative of the best functioning villous tissue. Four sections of placental parenchyma will yield 95% of villous abnormalities. Adequate placental diagnosis can be done with three to four cassettes, depending on the thickness of the placenta. Uteroplacental vessels should be available for review in all cases, especially when uteroplacental vascular pathology is suspected. In the simplest terms, normal fetal growth and development requires a normal fetal developmental program (i.e., a genetically normal conceptus). Abnormal karyotype—the presence of a developmental program manual with extra, missing, or rearranged pages—commonly precludes embryo/fetal development. If the fetus is viable, pregnancy success depends on the physiologic adaptation of the maternal spiral arteries (to allow dramatic increases in volume of uteroplacental blood flow at a pressure that is not traumatic to tissues), and on the development of a functional fetoplacental circulation. Evaluation of the products of conception should include a confirmation of intrauterine pregnancy, but should also assess why the pregnancy failed (see below). Partial hydatidiform mole, incorrectly referred to as a “transitional mole,” is the result of fertilization of a normal ovum by either two sperm (dispermic, diandrogenetic fertilization) or one diploid sperm (diandrogenetic fertilization).62 The tissue may be more abundant than expected for gestational age and usually includes membranes, rarely an umbilical cord or fetus. Only some villi are enlarged, resulting in a dual villous population (Fig. 4A and B). Variable syncytiotrophoblastic proliferation is the key to diagnosis. The diploid partial HM is reported to be more aggressive, yet some still question exactly what it may represent. Some clearly are complete HM, from early curettages in which the villous morphology has not completely developed, and others are twin gestations with a normal fetus and coexistent molar gestation.74, 75 A diploid ovum may be fertilized by a normal haploid sperm (digynic fertilization), resulting in a triploid abortus without partial molar features (Fig. 4C).73 Choriocarcinoma is a rare complication of partial HM. The several case reports76, 77, 78 often fail to completely describe the preceding molar lesion. Fig. 4. A. Triploid “partial” mole. Macrocystic vesicles interspersed with normal placental parenchyma. B. Partial hydatidiform mole with central cistern (arrows), irregular shape with stromal pseudoinclusions (open arrow) and syncytiotrophoblast proliferation (hematoxylin-eosin, ×10). 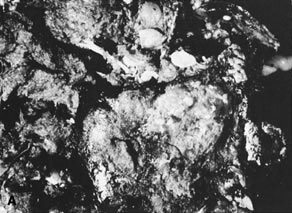 C. Triploid non-molar placenta with two villous population, villous irregularity resulting in pseudoinclusions, and absent trophoblast proliferation (hematoxylin-eosin, ×10). Hydropic abortus must be included in the differential diagnosis of molar gestation. 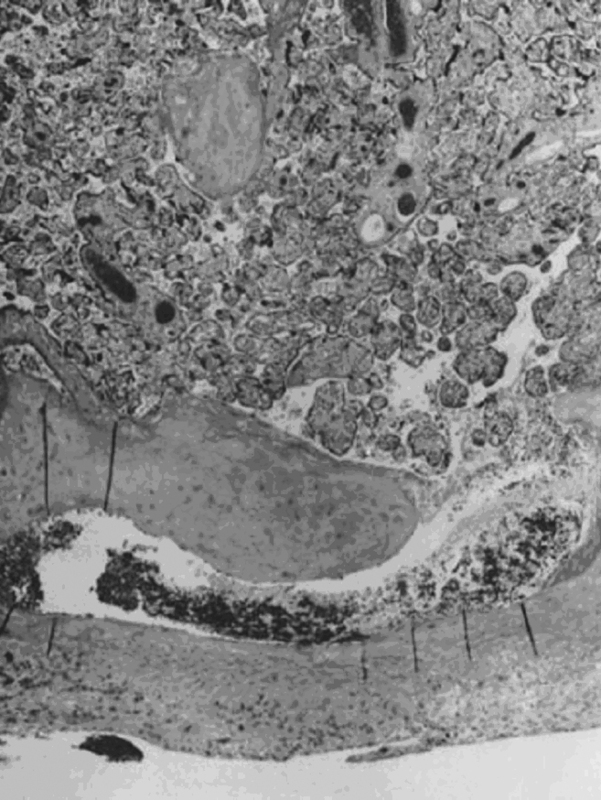 The classic features are amphophilia of the villous stroma and atrophy of the trophoblasts. The fetoplacental circulation is generally absent or collapsed. Trophoblastic proliferation, if present, is polar, representing a normally implanting villus. Nonmolar early pregnancy losses include nonmolar aneuploid conceptions and euploid fetuses (potentially viable, although single gene defects will be not identified by crude karyotype). The following working guides help frame our histologic analysis of products of conception and fetal loss. Findings need to be interpreted in the context of that patient's past reproductive history. To evaluate a sporadic abortion, the most important clinical distinction may be whether the pregnancy was likely euploid (and potentially viable) or not. Euploid pregnancy loss carries a maternal age-independent potential for recurrence, whereas recurrence of aneuploid loss tends to be tied to maternal age. Ploidy is less important if the patient has had three or more losses and is under 40 years of age, when the risk of serial aneuploid conceptions would be quite low. A recurrent aborter may have a sporadic aneuploid loss, but the critical point is whether any consistent pattern of injury persists across pregnancy losses and independent of ploidy. Pregnancy loss will be caused either by aneuploidy of the conceptus (pathology intrinsic to the conceptus), or by pathology extrinsic to the embryo/fetus (identifiable in the decidua and/or placenta). This also differentiates pregnancy loss by recurrence risk. Pregnancy failure may be caused either by a nonviable embryo/fetus, or by a decidual/placental environment incapable of supporting conceptus development. If the embryo/fetus is nonviable, then histopathology will reflect early embryo failure, with karyorrhectic (or absent) fetoplacental circulation. If the embryo/fetus is genetically viable, the cause of pregnancy failure may be observed or inferred from patterns of placental and/or decidual injury. “End-stage” pathology must be carefully distinguished from that potentially causing fetal death. In pregnancy loss, microscopic changes may begin to accumulate without clinical symptoms. By the time a pregnancy loss becomes clinically symptomatic (i.e., bleeding, cramping), an end-stage pathology (reflecting tissue degeneration common to all etiologic types of pregnancy loss) would be expected to close off blood vessels and allow tissue detachment from the uterus. Coagulation of maternal blood flow and altered inflammatory patterns are part of this final-common-pathway histology of miscarriage. Fetal viability may be estimated by the type of erythroid elements in the placental circulation. Nucleated erythrocytes are produced in the yolk sac and circulate in the early weeks of pregnancy. With hepatic hematopoiesis (weeks 7–9), anucleate erythrocytes begin to circulate. The proportion of nucleated erythrocytes is closely correlated with crown–rump length (Table 5).43 If the gestational age at fetal demise is known, the observed proportion of nucleated erythrocytes can be compared to the proportion expected for gestational age. A greater proportion of nucleated erythrocytes than expected for fetal age indicates abnormal hematopoiesis, such as seen in chromosomal aberrations (in particular triploidy and trisomies), or hematopoietic stress (e.g., hydrops fetalis, antiphospholipid antibody associated massive placental infarction, and recurrent midtrimester losses with dense chronic intervillous inflammation). Many histologic features can be evaluated in the placenta and decidua of early pregnancy loss. Those features that could be reliably distinguished in a routine clinical diagnostic service of nonrecurrent (sporadic) spontaneous loss are listed in Table 6.79 Patients had either their first or second loss karyotyped, and therefore did not meet criteria for “recurrent abortion.” Molar gestations were excluded and karyotype was grouped as euploid and aneuploid. The better preserved the fetal circulation, the greater the apparent age at fetal demise, the greater the likelihood of a euploid conceptus. The presence of villous infarct, chronic intervillositis, and chronic uteroplacental vasculitis were each independently associated with a euploid conceptus. From this we suggest that age at death can routinely be assessed by proportion of nucleated erythrocytes. The greater the fetal age assessed by the circulation, the greater the likelihood of euploid conceptus. Significant differences (p < 0.05) between pregnancy losses with normal and abnormal chromosome numbers. Fetal gestational age at death can routinely be assessed by proportion of nucleated erythrocytes. The greater the fetal age assessed by the circulation, the greater the likelihood of euploid conceptus. Specific decidual and placental lesions that implicate the maternal vasculature and/or chronic intrauterine inflammation are associated with euploid pregnancy loss. Those decidual and placental features not associated with ploidy represent the end-stage, common pathology of impending abortion. In our hands, no single feature is as useful as the equation that included all histologic features, maternal age, and the gestational age at loss calculated from the last menstrual period. This summary equation could estimate an 88% likelihood of aneuploidy, and a 96% likelihood of euploidy. Some have not confirmed the utility of specific lesions to diagnose aneuploidy.80, 81 Others find that specific features are associated with aneuploidy but with poor specificity.82, 83 A recent study of 668 characterized abortions obtained positive predictive values of >85% for euploidy for “autoimmune markers, chronic intervillositis, and increased perivillous fibrin with intermediate trophoblast.”83 Together with our study of sporadic, nonrecurrent loss, these studies of recurrent loss confirm the utility of placental diagnoses in ploidy estimation in early pregnancy loss. Why is estimation of likely ploidy clinically useful? Shifting the balance of likelihood of aneuploidy and euploidy from the statistical 50/50 true in the first trimester to “more likely” or “less likely” improves assessment of future pregnancy risks. There is increased risk of chromosomally normal pregnancy loss after an abortion with a normal karyotype.84, 85 Cheap determination of likely loss of euploid conceptions may permit earlier evaluations, without waiting for the third miscarriage. The same consistency in karyotype of loss can be seen among certain couples with recurrent aneuploid pregnancy loss.84, 86 Such patients may, at minimum, merit a second look at maternal triple screen results in their next pregnancy or consideration of amniocentesis. Nondisjunction has the same statistical probability of occurring in a recurrent aborter with antiphospholipid antibodies as in another woman the same age without recurrent loss. An aneuploid pregnancy loss does not, therefore, exclude the diagnosis of a chronic condition that would cause loss of euploid pregnancies as well. The linking of uteroplacental vascular and/or chronic inflammatory pathology to euploid pregnancy loss are consistent with associations of placental infarcts and, uteroplacental vasculopathy to maternal autoimmunity,87 and chronic placental inflammation to recurrent fetal loss.88, 89 Subclinical maternal autoimmunity has been identified in at least a subset of patients with otherwise unexplained abortion.90, 91 A major site of the pathology of the antiphospholipid antibody syndrome is the (maternal) uteroplacental vasculature.92 However, both histology and in vitro work suggest that the placenta is also a target of maternal immune-associated damage.92, 93 In women receiving therapy for recurrent spontaneous abortions, fetal karyotype combined with placental histopathologic assessment is helpful in deciding if treatment has failed or if that particular pregnancy would have been lost despite treatment. Pathologic examination of products of conception (POC) should include but not be limited to tissue documentation of the fact of pregnancy. Because the placenta may remain viable long after fetal death (as in cases of “blighted ovum”), villous trophoblast and stroma may be viable for weeks (and capable of direct cytogenetic analysis even if the embryo–fetus is dead). Confined placental mosaicism is a genetic circumstance not neatly classified by the above schema. An early divergence of cell lineage between placenta and fetus may lead to discordance of the genetic composition of the trophoblast and the conceptus;94 placental post-mitotic errors may also lead to confined placental mosaicism. 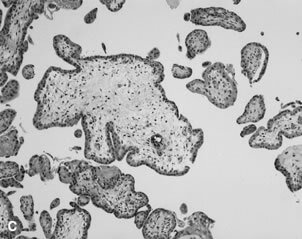 Kalousek has described three different forms of confined placental mosaicism.94 Direct (trophoblast) analysis of chorionic villous samples may not reflect fetal karyotype. The subject of mosaicism is outside of the scope of this review. Other more subtle features of placental dysmorphogenesis have been described and ascribed to specific conceptus karyotypes.95 These criteria have been difficult to apply in a clinical laboratory setting, but provide evidence that placental development is affected by karyotypic abnormalities. Aneuploidy is a less common but still significant finding in pregnancy loss after the first trimester. Liveborn infants are often dysmorphically anomalous; their maldevelopment is paralleled by relatively poor intrauterine growth symmetrically involving both the fetus and placenta. Most profound intrauterine growth restriction is seen in trisomy 18, with trisomy 13 and trisomy 21 showing progressively less severe effects. Most autosomal aneuploidies or heteroploidies are associated with growth-restricted infants. Trisomic placentas may have irregularly shaped villi and atypical stromal migrating trophoblasts.96 There are fewer small muscular arteries in the stem villi and reduced small muscular artery/villous ratio, but absolute villous count is normal.96 The villi are immature, with histology lagging about 4 weeks. A single umbilical artery is frequent in trisomy 18. 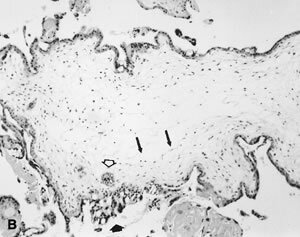 In monosomy X, villi tend to be small (with resultant apparent increased intervillous space) and either acellular and fibrotic or irregularly hypercellular. The villous trophoblastic layer is hypoplastic with infrequent syncytial budding. Triploid conceptions, especially those with a diploid maternal genome (digyny), may be nonmolar. In these cases there is usually scant tissue (less than expected for dates). Microscopic features may be relatively normal without trophoblastic proliferation. Tetraploid vili are large, round, and without trophoblastic proliferation. Krause WW: [Diphtheria as a general infection.] Med Klin. 1950 Apr 7;45(14):417-22.